Can't wait to see this month's essential oil infused Lifestyle Promotion from the World Leader in Essential Oils! Join our Community for updates, discounts & wisdom! Order sooner rather than later as supplies may run out! Remember that a Wholesale Account already provides a 24% Discount & this is an Extra 20% Discount on top of that! 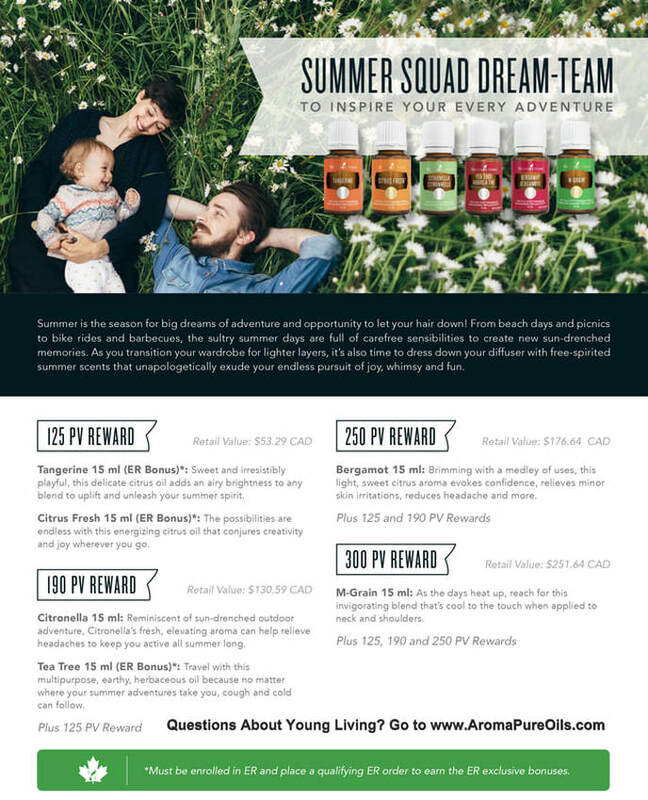 CONTACT Enzina to set up your order and get your free REWARDS! Wintergreen, Orange, Ylang ylang, Lemongrass, Grapefruit. ​Wintergreen, Orange, Ylang ylang, Lemongrass, Grapefruit and a Dewdrop Home Diffuser! PLUS ASK ABOUT THE ESSENTIAL REWARDS PROGRAM WHERE YOU SAVE AN EXTRA 10%-25% ON EACH AND EVERY ORDER. 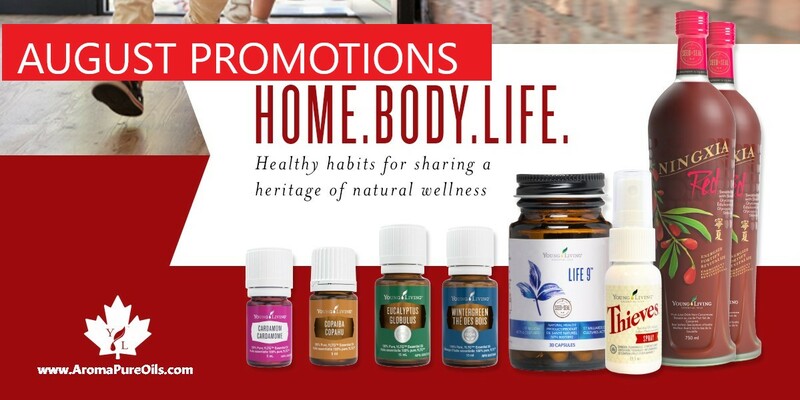 The following May 2016 Promotion is for Canadian Young Living Members. ​Order from the Canadian Product Guide through "Canada OTG Products" category. Make Your Mothers Day Memorable with May Promotions. Spoil yourself and all the mothers in your life with May promotions perfect for a relaxing and uplifting spa experience. Create your very own natural bath salts with essential oils that will keep your skin feeling soft and smooth while nourishing your emotional well-being at the same time. Enjoy the gift of relaxation and more with unique May promotions! 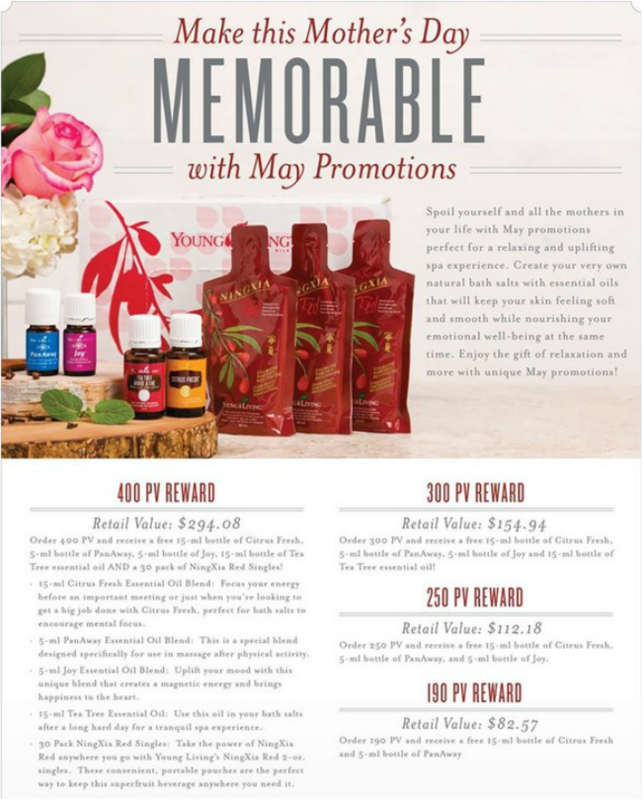 Reach any of the PV minimums with your May order to earn great free rewards. Order 400 PV and receive a free 15-ml bottle of Citrus Fresh, 5-ml bottle of PanAway, 5-ml bottle of Joy, 15-ml bottle of Tea Tree essential oil AND a 30 pack of NingXia Red Singles! Order 300 PV and receive a free 15-ml bottle of Citrus Fresh, 5-ml bottle of PanAway, 5-ml bottle of Joy and 15-ml bottle of Tea Tree essential oil! 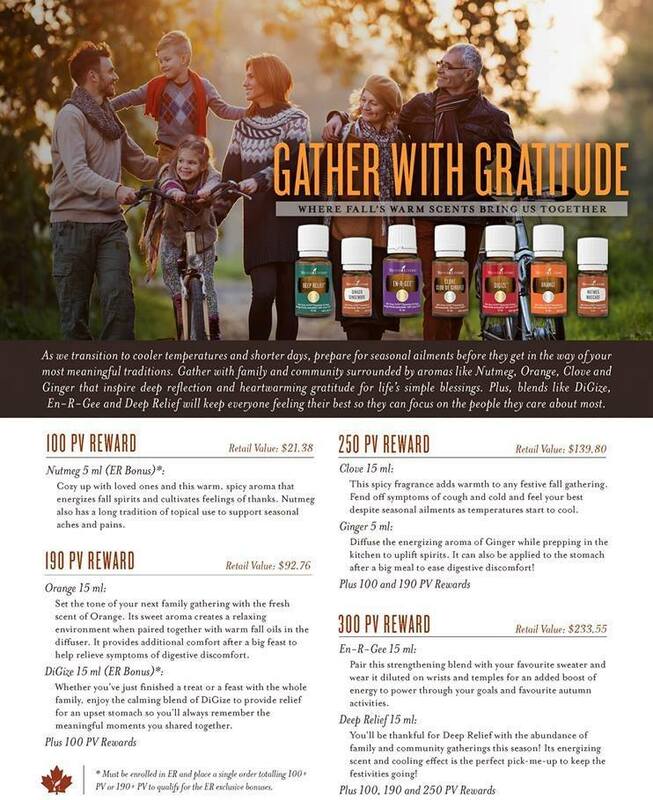 Order 250 PV and receive a free 15-ml bottle of Citrus Fresh, 5-ml bottle of PanAway, and 5-ml bottle of Joy. Order 190 PV and receive a free 15-ml bottle of Citrus Fresh and 5-ml bottle of PanAway. 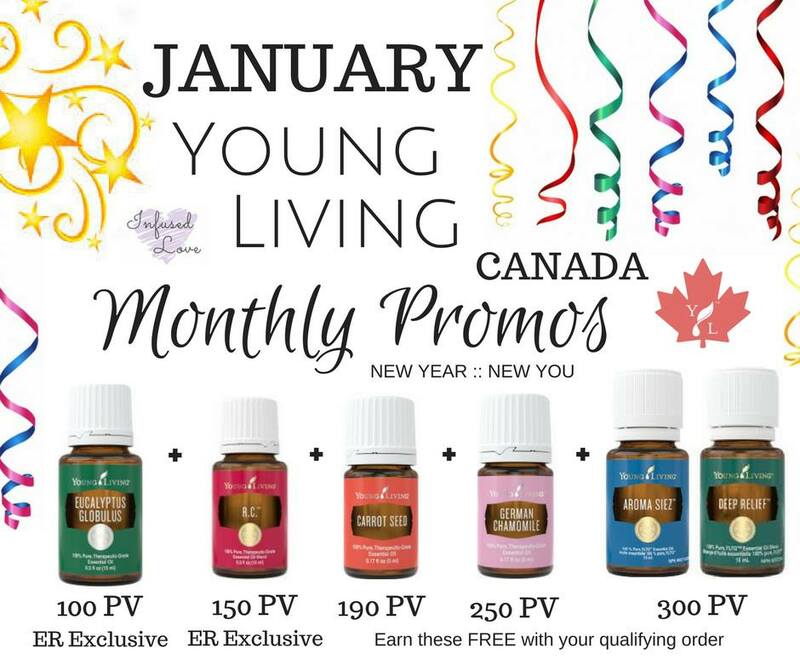 The following April 2016 Promotion is for Canadian Young Living Members. Spring is in the air! Dust off your old cleaning regimen and give a fresh, new essential-oil infused spice to your home with spring cleaning supplies that will get your home looking and smelling fresh from top to bottom. Invite deeply fresh scents and clean aromas into your home with invigorating April promotions! Reach any of the PV minimums with your April order to earn great free products and rewards. Order 300 PV and receive a free 15-ml bottle of Thieves Essential Oil blend, Thieves Foaming Hand Soap, Thieves Spray, 15-ml bottle of Lemon, Thieves Household Cleaner AND a $20 product credit! Thieves Foaming Hand Soap: Spruce up your bathroom for guests with this blend of Thieves, Lemon, and Orange essential oils, perfect for a gentle and natural alternative. 15-ml Thieves Essential Oils Blend: Diffuse before, during and after your spring cleaning regimen to keep unwanted odours at bay. Thieves Spray 1 oz: Use this portable cleaning spray for purifying small surfaces on the go….doorknobs, handles, toilet seats, and more. 15-ml Lemon Essential Oil: With its bright and joyful aroma, Lemon oil is an ideal scent for spring. Putting a few drops of Lemon in your cleaning products can add a cleansing citrus burst, perfect for spring cleaning! Thieves Household Cleaner: Create a welcoming home that's clean and comforting for everyone with the fresh and inviting scent of Thieves Household Cleaner to get a truly deep clean. 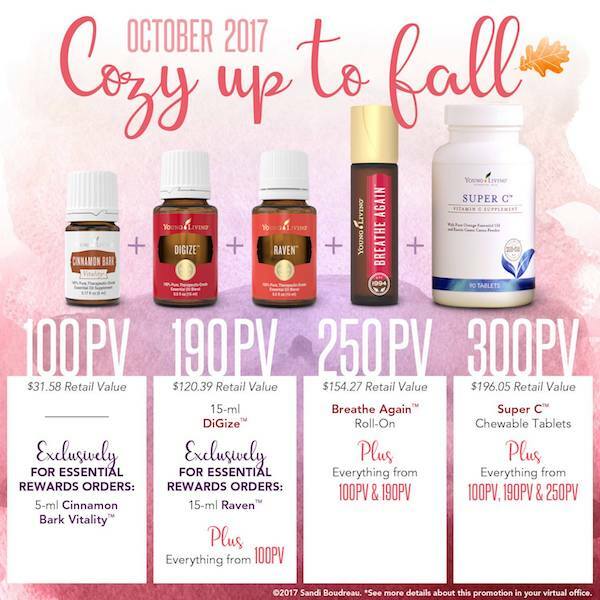 $20 Product Credit: Use your product credit just like real cash to purchase popular Young Living products. Order 250 PV and receive a free 15-ml bottle of Thieves Essential Oil blend, Thieves Foaming Hand Soap, Thieves Spray and 15-ml bottle of Lemon essential oil. ​Order 190 PV and receive a free 15-ml bottle of Thieves Essential Oil blend and Thieves Foaming Hand Soap. 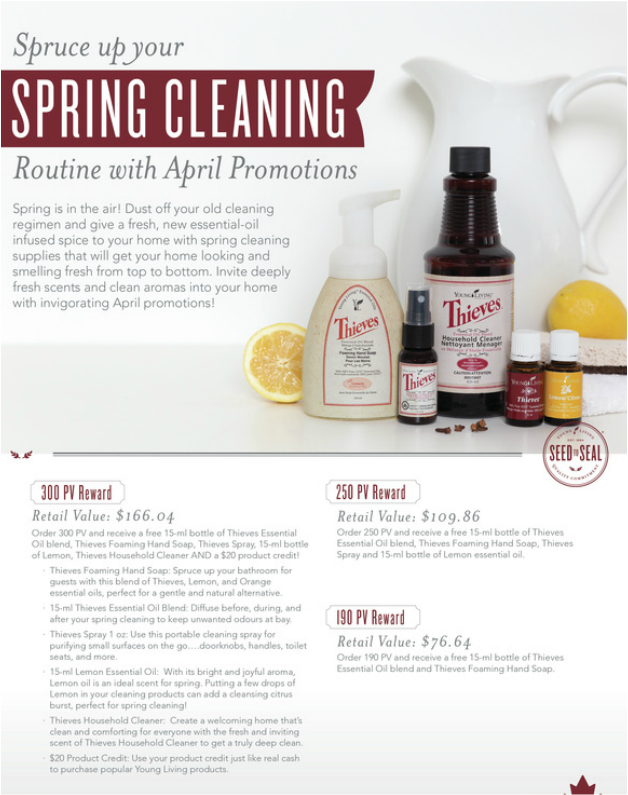 ​The following Spring Cleaning Promotion is available for Young Living Members both in the US & Canada. Canadian Members order from the US Product Guide through "NFR Products" (Not For Resale) category. Wellness with Essential Oils. Watch the Intro Video! 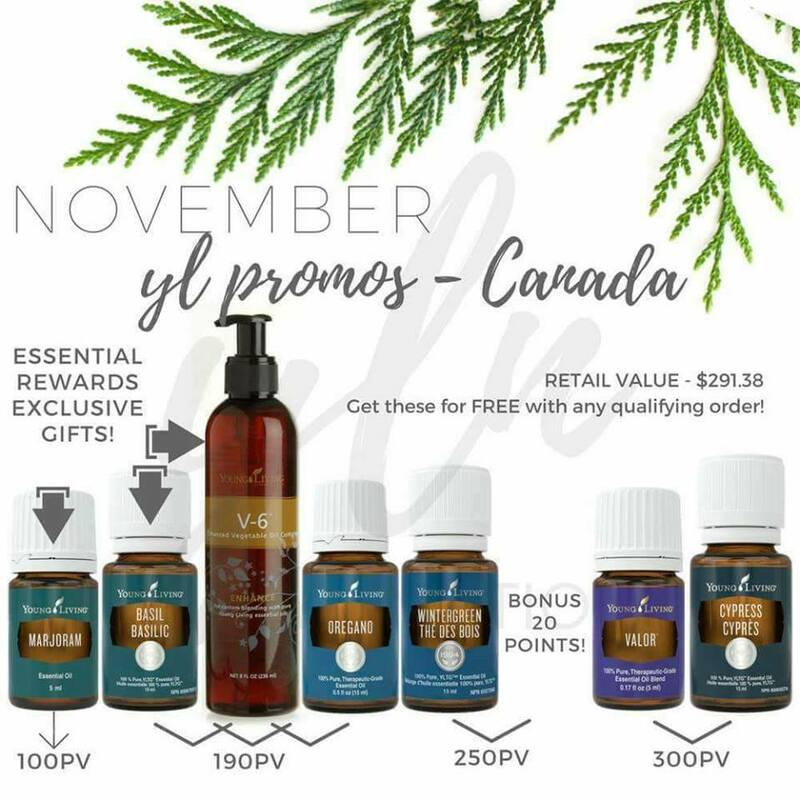 ​The following "Green" Promotion is available for Young Living Members in Canada. The following March Promotion is for Canadian Members. Order from the Canadian Product Guide through "Canada OTG Products" category. 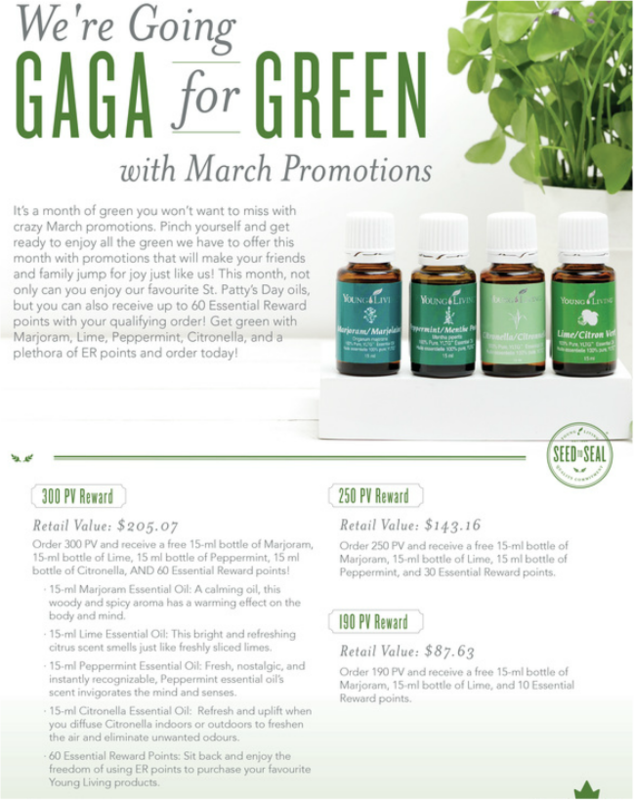 We're Going Gaga for Green with March Promotions for Young Living Canada. It’s a month of green you won’t want to miss with crazy March promotions. Pinch yourself and get ready to enjoy all the green we have to offer this month with promotions that will make your friends and family jump for joy just like us! This month, not only can you enjoy our favourite St. Patty’s Day oils, but you can also receive up to 60 Essential Reward points with your qualifying order! Get green with Marjoram, Lime, Peppermint, Citronella, and a plethora of ER points and order today! Reach any of the PV minimums in a single March order to earn great free rewards that will knock your socks off. 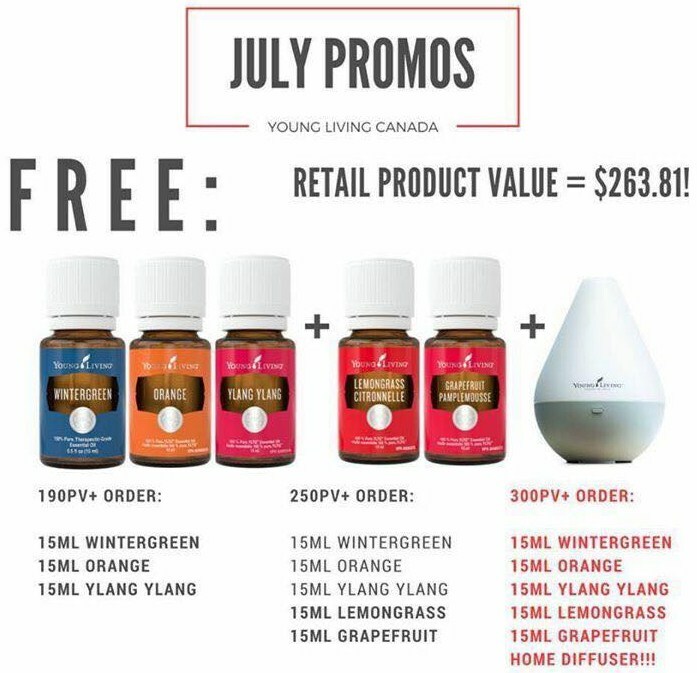 Order 300 PV and receive a free 15-ml bottle of Marjoram, 15-ml bottle of Lime, 15 ml bottle of Peppermint, 15 ml bottle of Citronella, AND 60 Essential Reward points! 15-ml Marjoram Essential Oil: A calming oil, this woody and spicy aroma has a warming effect on the body and mind. 15-ml Lime Essential Oil: This bright and refreshing citrus scent smells just like freshly sliced limes. 15-ml Peppermint Essential Oil: Fresh, nostalgic, and instantly recognizable, Peppermint essential oil’s scent invigorates the mind and senses. 15-ml Citronella Essential Oil: Refresh and uplift when you diffuse Citronella indoors or outdoors to freshen the air and eliminate unwanted odours. 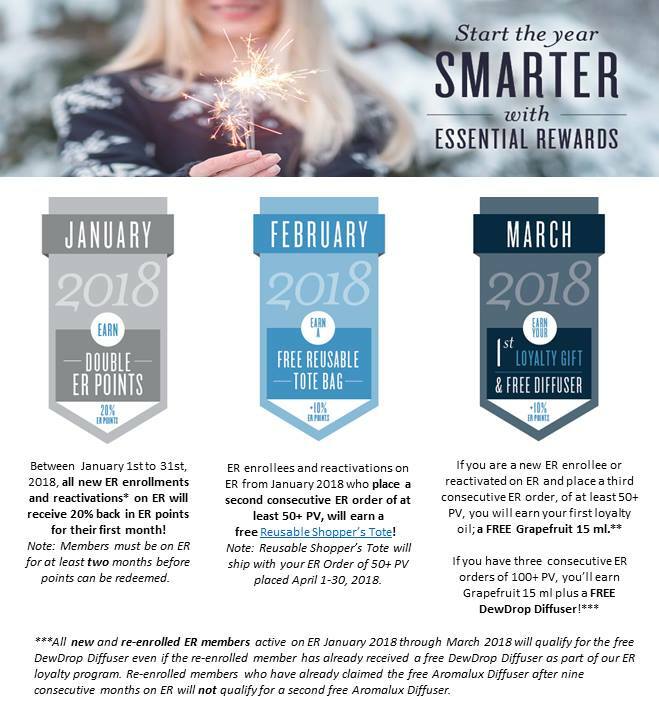 60 Essential Reward Points: Sit back and enjoy the freedom of using ER points to purchase your favourite Young Living products. Order 250 PV and receive a free 15-ml bottle of Marjoram, 15-ml bottle of Lime, 15 ml bottle of Peppermint, and 30 Essential Reward points. Order 190 PV and receive a free 15-ml bottle of Marjoram, 15-ml bottle of Lime, and 10 Essential Reward points. Relax ~ Rejuvenate ~ Revive! Onsite Holistic Services & Women's Coaching: We serve Toronto, the Greater Toronto Area (GTA), York Region, Thornhill, Richmond Hill, Aurora, Vaughan, Maple, Markham, Newmarket, North York.